Shoyo Hinata saw the legendary volleyball (haikyu) player known as “the Little Giant” compete at the national volleyball finals. It was then that Hinata began aiming to be the best volleyball player ever. However, in a sport in which tall athletes dominate, Hinata's height of 5'4” is considered too short. Now playing for Karasuno Public High School with his rival, Tobio Kageyama, Hinata does not believe that a player needs to be tall in order to play volleyball, especially when a player can jump higher than anyone else – as he can. As Haikyu! !, Vol. 10 (entitled Moonrise; Chapters 81 to 89) opens, Hinata boldly proclaims that he wants to change the (in)famous “freak quick.” That perturbs Kageyama, who sets him up for this fearsome spike, and he stops speaking to Hinata. This feud throws the entire team off their game, so now the players on Karasuno High's volleyball team have to step up their game and evolve into a new team or simply break under pressure and fall apart. THE LOWDOWN: The Haikyu!! manga, with each volume, makes strides to be a memorable shonen sports manga, perhaps even in the vein of Tite Kubo's legendary basketball manga, Slam Dunk. Creator Haruichi Furudate delves deep into the game and into the hearts of the players. Haikyu!! Volume 10 turns out to be a special volume, one that does indeed get to the heart of the matter when it comes to the players. The reason that this volume is entitled “Moonrise” might not make sense until the end of the volume, but the result is a hearty tale of why some people put so much into performing well in sports and why some players put even more than that. The creators of long-running manga sometimes offer a run of chapters that at least attempts to explain why their series matter beyond being entertainment. Furudate does that with the chapters contained in Vol. 10 of Haikyu!! 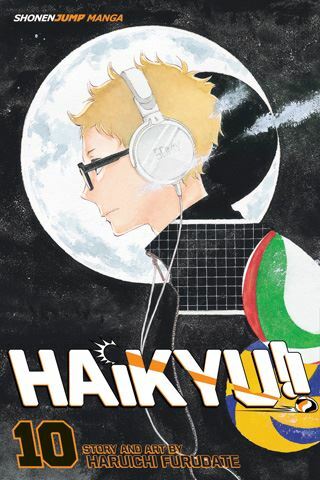 I READS YOU RECOMMENDS: Fans of sport manga will want the Shonen Jump title, Haikyu! !